Neutral cleaner for daily maintenance. 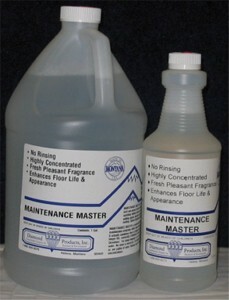 Maintenance Master is perfect for cleaning floors or any other hard non-porous surface without rinsing. Leaves surfaces sparkling without streaks or dulling film. Maintenance Master is specifically designed to be used in daily floor maintenance programs either when damp mopping or using an autoscrubber.